Because of frequent visits to the Canaries, where this feather palm is native, I suppose this is a favourite palm. It is one of about 16 phoenix species that are native to Africa, east through Asia. They are dioecious, meaning that the plants are either male or female and they all have very spiny leaf bases where the lower leaflets are transformed into very vicious thorns. This must protect the young plants and the base of the plants from grazing animals and it makes keeping the base free from fallen leaves a very painful job. 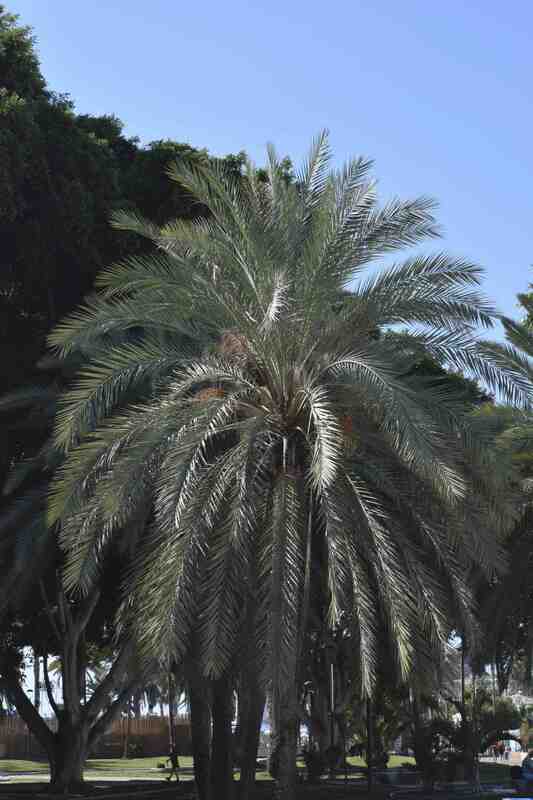 It is closely related to the important date palm (P. dactylifera) and the two species hybridise. In fact, hybridisation is one of the biggest threats to wild populations of P. canariensis in the wild. 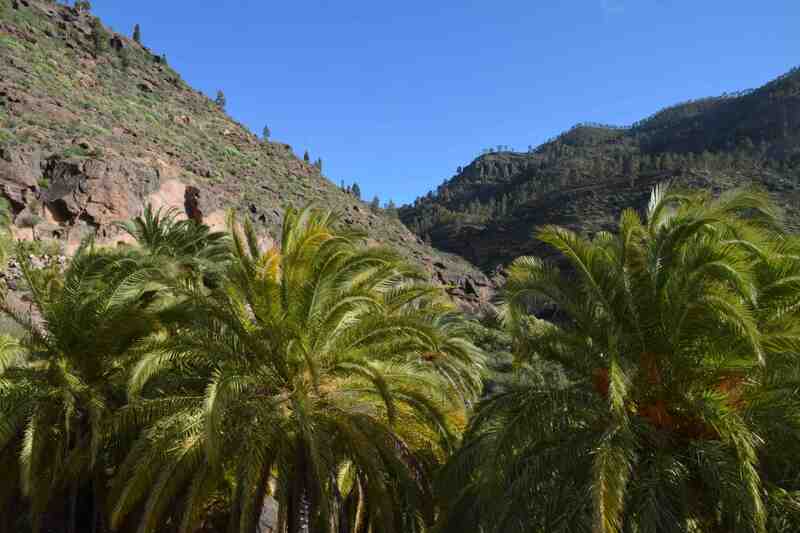 Phoenix canariensis differs from the true date palm in its fuller look and greener leaves. The fruits are smaller too and although edible, the flesh is very thin. 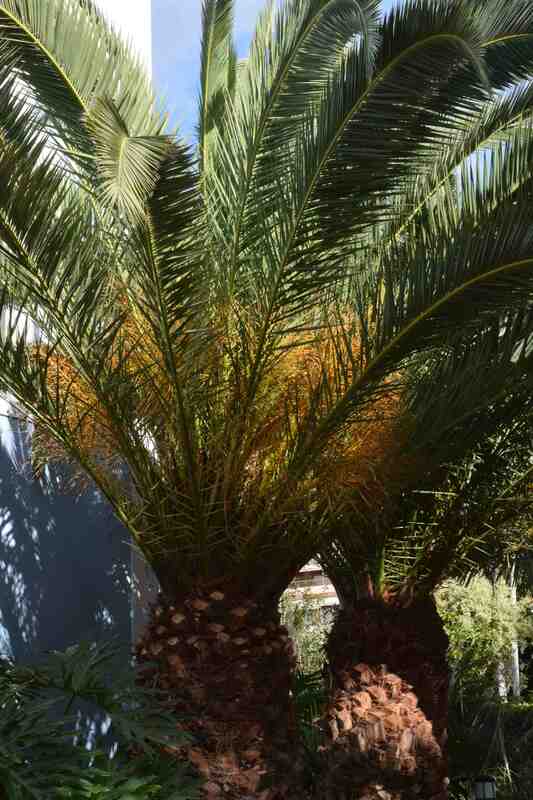 In cultivation, because the Canary date palm is much more tolerant of wet, it is much more amenable to less than perfect conditions and of wet, cold climates. As a result it is often to be seen in the UK growing well outside. It is frequently sold, at reasonable prices, in garden centres, as a hardy plant but beware because it does need careful placement and it can’t really be regarded as hardy. For that you need to stick with trachycarpus. However, it is worth a gamble since it is cheap to buy because it grows quite quickly from seed. It often produces pinnate leaves in the second year from seed and can start to make a trunk when as little as 5 years old, but not in the UK – it will take much longer. It has the potential to reach 30m in height but 20m is more usual. Large specimens for sale are usually shuttlecock shaped and have leaves, growing from compost level, about 2m long. When mature the leaves can be 6m long. The plant below puzzles me a little because it has quite grey leaves and a rather sparse look. I have vacillated between the common and the Canary date palm, never happy with the identification but perhaps I should relax and it could be a hybrid. It would make sense and stops me worrying!